by Benjamin, Ludy T., Jr.
No subject captures the attention of people today more than psychology. It pervades television in the form of soap operas, celebrity court cases, police and hospital dramas, talk shows, 'reality ' shows, and infomercials. It is the stuff of movies, magazines, plays, novels, self-help books, sports, jobs, music lyrics, talk radio, and the internet. 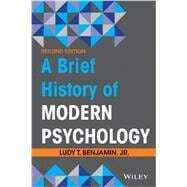 In A Brief History of Modern Psychology 2e, Ludy Benjamin, a leading historian in the field, discusses the history of both the science and the practice of psychology since the establishment of the first experimental psychology laboratory in 1879. In engaging prose, this book weaves together the historical and disciplinary context that will help readers to better understand the richness and complexity of contemporary psychology.